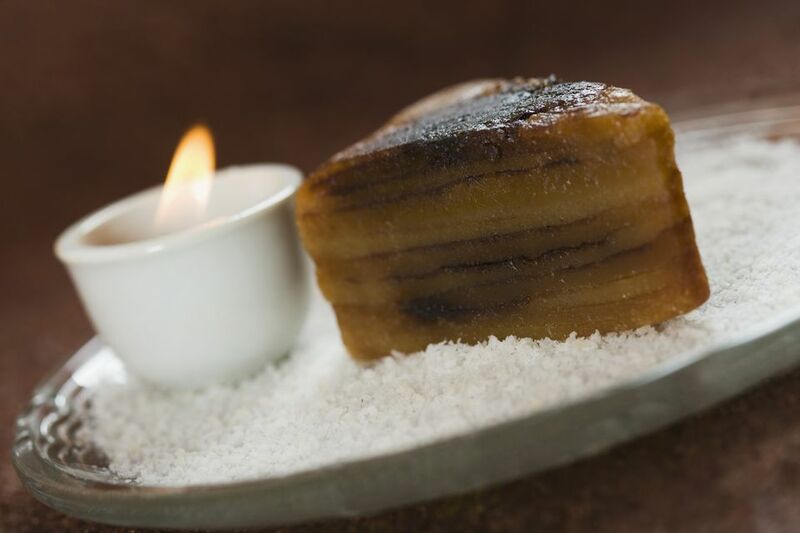 A traditional, rich dessert, Bebinca is a must-have at any celebration in Goa, India. The multi-layered cake is made up of thin layers of a coconut flavored batter separated by melted ghee (clarified butter). Making Bebinca, also known as Bebik, requires patience and a lot of time (plan on at least 2 hours); each layer is cooked separately, requiring you to take the pan out of the oven repeatedly—but the end result is well worth the effort. Traditional Bebinca has 7 layers, but some cakes go up to 16 layers; you can make as many as you like. As Bebinca is the only dessert truly unique to Goa, it is often referred to as the "queen of Goan desserts." You will find it on Christmas and Easter tables, as well as at weddings and gatherings celebrating a birth. In a bowl, mix the coconut milk and sugar together and stir until the sugar is completely dissolved. In another bowl, whisk the egg yolks until creamy. Add the coconut milk mixture to the eggs and combine well. Add all the flour, a little at a time. Mix well, making sure that no lumps are left. Preheat the broiler and set a rack in the middle of the oven. Put 1 tablespoonful of ghee in a baking pan (any shape) at least 6 inches deep. Put the pan in the oven on the middle rack and cook until the ghee melts; watch carefully. Take pan out of the oven and pour in enough of the prepared batter to form a 1/4-inch-thick layer. Put the pan back in the oven and cook until the top is golden, watching carefully. Remove from the oven again and immediately add another tablespoonful of ghee on top of the previous layer. It will melt automatically because of the heat. Pour another layer of batter of the same 1/4-inch thickness. Cook until golden. Keep repeating the layering process until all the batter is used up, saving ghee for the top layer. When the cake is done, turn the Bebinca over on a wire rack to let cool. Move to a serving plate, garnish with almond slivers, and cut into slices; serve room temperature or cold. This is the type of recipe where practice makes perfect, so don't get discouraged if your first attempt doesn't look perfect (it will still taste delicious, though). The more often you make this cake, the more skilled you will get at creating even layers. Once you determine how much batter is needed to make a 1/4-inch layer, use that same measurement each time. Do the same for the cooking time—keep track of how long it takes for the layer to brown on top and set a timer for each layer.